Updated 13 December 2013. The British Medical Association has written to a number of football clubs urging them to end sponsorship deals with e-cigarette companies and to ban the use of e-cigarettes at their football grounds. I think the lines taken by the BMA are scientifically flawed and likely to cause harm by making it harder for people to quit smoking by switching to vaping. They stress minute obscure risks and ignore huge potential benefits, and they argue with an authority not backed by the quality of science argument. So here is an anonymised example of the letters they have been sending, along with how I would reply if I was an organisation on the receiving end of this. My suggested reply from any club or other organisation that receives a letter like this… note: no club has sent this to them, but I’d be very happy if they did. Thank you for your letter of 17 October 2013, and for your concern for the health of our supporters. We note the views of the BMA Board of Science with interest, but we have reviewed your position statement on e-cigarettes and did not find the limited account of the scientific understanding of e-cigarettes in the briefing to be sufficient to justify the hostile stance set out in your letter, especially given the views expressed are contentious and disputed by other experts. We can recommend the recent review by Polosa et al 2013: A fresh look at tobacco harm reduction: the case for the electronic cigarette for a more complete account. We would also like to point to a much more enlightened position taken by a group of 10 senior physicians in France (La Parisienne / English extract) and the much more humane and proportionate stance taken by Professor Lynn Kozlowski, Dean of the School of Public Health at Buffalo, State University of New York: 9 things to think about when you think about e-cigarettes. It is a shame that the BMA does not offer this sort of confident leadership in public health. We will pick up some of the specific points raised in your letter below. A smoking product? Your assertion that we are ‘advertising a smoking product‘ is perplexing. We assume you recognise that in both common sense and in law, “smoking” involves a combustion process. No combustion is involved in e-cigarettes and there are therefore none of the thousands of products of combustion that cause the harms associated with smoking. We regard this difference as the most important feature of e-cigarettes and not something that should be easily confused or misrepresented. The same issue goes to the heart of the BMA’s apparent confusion over the legal status of vaping. The BMA believe e-cigarettes should be included in the smoking ban, but this would be unlawful precisely because there is no combustion. In Scotland, the Smoking, Health and Social Care Act (Scotland) Act 2005, and in England the Health Act 2006, implement the respective governments’ smoke-free policies. These quite properly refer to smoking and smoke as arising from tobacco or other substances that are ‘lit’. This is not accidental or poor drafting: it is combustion that poses the material risk and the reason for controls under this legislation. Including e-cigarettes in the smoking ban? You say that the the BMA believes that e-cigarettes should be included in the ban on smoking, and would presumably wish to amend the law to allow for this, but you do not really say why. Our understanding is that there is no material risk to bystanders and that any nuisance or irritation arising from other people’s ‘vaping’ is negligible. On the basis that no-one else is harmed or troubled, we see no reason to ban these products. 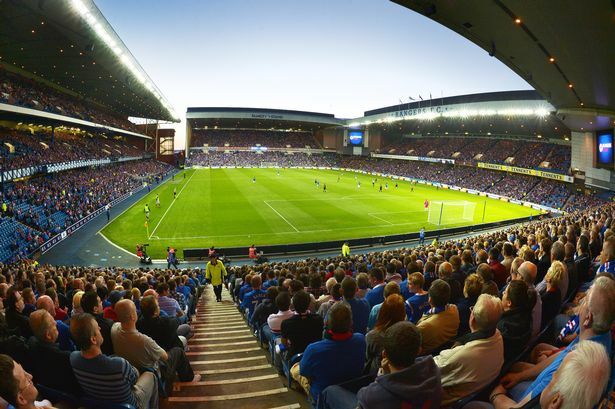 Furthermore, we think there is an opportunity at the stadium to encourage fans to try an alternative to smoking that could be transformational for their health. We do not accept that it poses a risk merely because in some circumstances it can look like smoking, any more than we accept that drinking water in public increases vodka consumption. We credit our supporters, and people generally, with a more considered approach to their lifestyle and their habits. If anything, we expect publicly visible vaping to ‘normalise’ vaping, not smoking, and to encourage switching from cigarettes to e-cigarettes with great benefits. If you have evidence there is a material risk, we would be grateful to receive it. We know of none. “If those young people are people who would have smoked but instead they’re using e-cigarettes, then that’s a huge public health gain. If they’re people who would never have smoked but they’ve taken up e-cigarettes, frankly in public health terms it’s not really an issue – it’s like drinking coffee or something, there’s no real risk associated with it. Lack of studies? You move on to argue that there is a “lack of rigorous, peer reviewed studies to support the use of e-cigarettes as a safe and effective nicotine replacement therapy“. It is a pity you have not summarised the studies that have been done in this area and how you interpret them. The research base is developing well and several studies show reasonable smoking cessation efficacy compared to NRT (for example, Bullen et al 2013; Caponnetto et al 2013). However, this is to miss the point. These products are not designed as alternatives to NRT. Their purpose is to provide satisfactory alternatives to smoking cigarettes at a tiny fraction of the risk. The studies that have been done so far understate their potential benefits in at least three ways: (1) more smokers may find this option more appealing and easier than NRT and therefore be willing to try it; (2) users progress over time and learn how to use the products more effectively and may experiment with different products and liquids until they find one that works well for them; (3) the products are evolving and most studies published so far use earlier models now considered obsolete. A good scientific approach would consider all sources of evidence and weight them in an overall assessment – including RCTs, cross-sectional studies, surveillance and surveys, sales data for e-cigarettes and cigarettes, user testimonies and so on. Taken as a whole, the data suggest that e-cigarettes are displacing smoking and reducing cigarette consumption and creating a benefit to health at individual and population level. If you know of other data, please share it and we will consider it alongside your proposals. Regulation can change everything: Medical regulation of e-cigs could fundamentally change the category. We believe many current suppliers would struggle to meet medical standards, and for the UK they may have to by 2016. Big players with deeper pockets would survive and prices could rise – a hugely preferable outcome for Tobacco. Passive vaping? We were surprised that you raised the concept of ‘passive vaping’ in your letter. On what basis does the BMA believe this poses any sort of health risk? Nothing in your briefing or letter justifies this positioning. There are barely any hazardous substances in the vapour itself. They are not merely ‘lower than with smoked cigarettes‘ they are much lower – in some cases hundreds of times lower or undetectable and at residual levels found in pharmaceutical grade products. The exhaled vapour is then greatly diluted in ambient air to the point where we simply cannot foresee any risk. If the BMA believes there are quantitative grounds for concerns about passive vaping, for example with reference to occupational health limits for hazardous substances or some other meaningful proxy for risk, then we would welcome sight of any evidence. In the meantime we regard this idea as a distraction. A fair assessment of the potential benefits? In proposing that we should end sponsorship and ban e-cigarette use on our premises, the BMA has exclusively emphasised risks and problems, and largely without a credible supporting case. However, the BMA has paid no attention at all to the potential benefits and opportunities that arise from e-cigarettes. If we were to follow your advice and ban e-cigarettes there is risk of a lost opportunity to convert supporters from smoking to vaping, with lost benefits to their health. If the BMA Board of Science wishes to write a convincing letter on this subject, then it needs to weigh the small and implausible risks highlighted in your letter against the potential lost opportunities for health improvement if we were to follow the prohibitionist course you suggest. We are open-minded and willing to engage in debate based on a reasoned assessment of evidence and even-handed approach to uncertainties. However on the basis of your letter, we will not be reconsidering our sponsorship arrangements with e-cigarettes. We continue to regard the sponsorship as beneficial to health in that it will encourage smokers among our supporters to consider a much safer alternative and to feel that the club is backing them in their efforts to give up cigarettes. We will continue to allow the use of e-cigarettes in the stadium as we believe that seeing e-cigarettes in use will further encourage more of our fans to think about switching. We have seen little to suggest any of the concerns raised in your letter amount to a material risk to the health or welfare of anyone, and we note with disappointment you have dwelt only on speculative downsides but have ignored the very significant potential benefits recognised by other authorities in public heath. UPDATE 13 November 2013 – on 3 November I e-mailed the BMA (Helen Reilly in Scotland and Vivienne Nathanson in London) to ask for a meeting. No reply so far. So much for open-minded and relentless quest for the best public health policies. Here’s the letter. I am writing in response to the BMA’s campaign to exclude e-cigarettes from football grounds and to its hostile stance on ‘vaping’ more generally. I would very much welcome the opportunity to discuss these concerns with the BMA public affairs function, and to have the opportunity to raise these points with Dr Thomson, Professor Hollins or any other appropriate member of the BMA Board of Science. I would be happy to meet in London, where I am based, or to travel to Scotland as appropriate. My concern is exclusively for public health through ‘harm reduction’ strategies. I have no competing interests and receive no funds from e-cigarette, tobacco or pharmaceutical companies or their agents. I was previously Director of Action on Smoking and Health (1997-2003), hence my interest. Dear Clive, Unfortunately, I am not able to arrange a meeting, but if you would like to contact members of the Board of Science, you can do so by writing to them c/o BMA House, Tavistock Square, London WC1H 9JP. I am surprised. Why are you unable to arrange a meeting? Your organisation is taking an aggressive approach to low risk alternatives to smoking and the people who are benefitting from it. To regard this as violating the medical ethos of ‘first do no harm’ is a credible perspective. Do you not think it would be better to meet your critics and discuss their concerns? If you are unable to arrange a meeting, I would be happy to. I could probably arrange for you to meet some ‘vapers’ too, if that would be of interest. Two weeks later (13 Dec) – no response to this offer to facilitate a meeting. New development. But now a new front has opened: Sense about Science (motto: equipping people to make sense of science and evidence) asks the BMA: what’s the evidence for banning e-cigarettes? It seems the BMA doesn’t want to talk to them either. “Bla bla…may lead children to think it is acceptable to smoke…bla bla”! So it is unacceptable to smoke now??? Last time i checked they sold it in the stores… I thought i felt a NAZI breathing down my neck when they turned prices up 4times (in norway) what it was when i started smoking 16yrs ago. This happened in perhaps 4 years. They first doubled the price, then a year or 2 later, they increased the price with the original price again, and a year or 2 later, pulled the same BS on us again – much like they talk about drug dealers handing out drugs out for free to get people hooked, and then turning the prices up… Well, now i KNOW that NAZIs thinks they are better than me, and expect ME to live the way THEY like to live THEIR lives. Im not forcing anyone to be like me. Im just ME and let OTHER PEOPLE be THEMSELVES!!! MAN – I -HATE- SOME -ARROGANT- PRICKS!!! I cant see how people can put up with such ARROGANT leaders! Are people so weak that they just sit there and accept to be bullied around like this? Something NEEDS to be done about these [CENSURE]! I suggest going into strike. No work until we get the respect we should expect to get from our leaders. Im not working, and im not going to either. If they want me to work and pay tax like an adult – then they need to start treating me like an adult… IM in charge of MY life – and there is NOTHING anyone can EVER do to keep me from living MY LIFE as I see fit!!! Im glad i dont have kids to support, so id NEED to work. Now its just me, and i can live on wellfare for the rest of my life if thats how they want it… Try to FORCE me – and you will get NOTHING but the OPPOSITE result. Im a STUBBORN SOB – and i think its about freakin time some more people got a little stubborn as well… We dont need a war or anything – we just need to do NOTHING – BECAUSE ITS ACTUALLY -WE- WHO ARE THE POWER OF THE NATIONS, and WE are running the world – as soon as we realize it and stand up for ourselves!!! I have emailed both the BMA people you mention in the article in the hopes that a bit of outside pressure might prompt them to get back to you. I own an e-cig site and I’d welcome regulation into the industry. However, I still think e-cigarettes are a viable alternative to tobacco and should be endorsed. Let’s face it – ecigs deliver nicotine but at least they don’t deliver tar, rat poison, and thousands of other chemicals and carcinogens. In the end, isn’t anything better than tobacco, really? Great response to the BMA’s madness ….. or corruption (conscious or unconscious) by big Pharma. I despair of medical organisations – they cannot seem to be objective any more. If they ever were. I am so very glad to see someone knowledgeable, in a public position in the UK, take on the misinformation being disseminated about e-cigarettes. I’m a new “vaper” (3 weeks now) and these devices have given me hope – at last! – that I might eventually kick my tobacco habit of over 40 years. Already I’ve reduced from over 30 a day to around 10 a day – and its been easy. I don’t have that sense of panic and deprivation that has always hit me when I’ve tried to cut down before, using NRTs prescribed by my GP (at substantial cost to taxpayers!) that just don’t do the trick for me. I know that e-cigarettes may not be COMPLETELY safe, but I have read a LOT about the research that has been done and am completely certain that they are many times safer than tobacco cigarettes! And what, in this life, can we say is COMPLETELY safe anyway? I don’t think the licensed NRTs (or any other drug prescribed for me by my doctor) can claim to be completely safe. I go out and breathe car fumes every day – and I know that’s not good for me. I drink alcohol, I eat “ready meals” containing additives, I eat fruit and veg that have been sprayed with toxins, I cross the road, etc. Life is not completely safe – and I would not want it to be! But I WOULD like to stop doing something that I know will shorten my life and probably in a very nasty way….i.e. I want to stop smoking tobacco – before I get full-blown COPD, for preference. It is so VERY important that e-cigarettes are not regulated out of existence – or into a position where they are no longer attractive/viable/affordable. Maybe its true – they need a new name that is less reminiscent of the deadly tobacco cigarette. Perhaps …… “personal vaporisers” or something like that?? Hmmmm. Anyone got a good idea for an alternative name?? What a brilliant comment! If only the health establishment, European Union and WHO could see things that clearly! A friends sensible advice about inhaling flavors is – change the flavor mix you use regularly , that way it is unlikely that your level of exposure to any one flavor could ever rise enough to be potentially a risk. Great stuff as usual, Clive. I particularly liked Motorhead’s comment on the sponsorship of football clubs by alcohol companies. I have always be rather bemused by the fanaticism of the anti-smoking campaigners when compared with the lack of publicity given to the dangers of alcohol. While no one now would disagree that smoking is very very bad for one’s health, so is anything other than a very moderate intake of alcohol – and I suspect that the social consequences of excessive drinking, and the consequence to the public purse, is far greater than any similar social consequences of the use of tobacco. I suppose all I am trying to say that attitudes in public health are not always based on scientific objectivity! From memory nicotine is extracted by a base(alkaline) process that is similar to that used to extract many other plant based drugs. and the levels of residuals are very low, many of these compounds are also found in a few plant based foods. Am on the road, mate of mine is a industrial food and pharma chemist/engineer,will ask him for more details when I am back home, if you like . Obviously not using ANY drugs at all is best, but ‘just say no’ is not a viable real world approach. The levels of contaminants in professionally extracted nicotine , as used in NRT products generally, are extremely low. This is well documented and the process is old and well tested. there is a distinct possibility that one or two of these flavorings might be an problem if inhaled regularly- For example there was once a synthetic ‘vanilla’ type flavor that turned out to be strongly linked to a serious lung condition in workers exposed to it on a long term and high dose basis. Of course all of this must be balanced against the very much larger (several orders of magnitude bigger) danger of inhaling any kind of combustion smoke (and carbon monoxide) on a daily basis. Ah, OK. It’s an interesting topic since the material is probably extracted using benzene or something similar. There are several professional chemists on ECF who make it their business to investigate such issues, so if you asked for assistance you might strike lucky – they have access to full lab facilities. ECITA also has a GC-MS machine so if you sent them some samples and explained why it might be of interest to them, they might assist. My guess is that, since (from memory) the material is first aggregated to a concretion, then diluted to a flavouring, then added as perhaps 5% to an excipient, then nebulised (which is not a 100% efficient transfer method for all ingredients), any particular contaminant will not comprise more than a trace. As the dose makes the poison, it probably isn’t something to be unduly worried about. Vaping cannot be any less than three orders of magnitude safer than smoking, and if you wanted to make it four orders less (and perhaps more), then vape unflavoured or minimum-flavoured refills (since as you rightly infer, the flavours are the unknown risk factor). On average it does not seem worth worrying about too much. Also, Prof Polosa and FlavourArt in Italy run in vitro cell tests on flavouring materials, and these would be the best people to contact in relation to lung cell tests of any similar materials. This points — to me at any rate — to a number of interesting issues, particularly if any of the major jurisdictions limit flavor to say, tobacco and menthol only. The existing tobacco flavors are not good. I think this explains why there is such a high percentage of use of non-tobacco flavors where — by and large — the existing users are smokers and former smokers. [Go back historically and look at the entirely modest market share for non-menthol flavored cigarettes]. I am not a flavor expert, but I frequently question to what extent “tobacco” flavored e-cigarettes taste like tobacco at all. For example, Lorillard’s product — to me — is predominantly a chocolate flavor. If we were to call these “flavor notes” — to what extent would they be allowed in a tobacco/menthol only framework? And whether we will look at actual flavor compositions is similarly an interesting question. Historically, flavors have gotten a pass, but I think that flavor compositions will tend to come into the crosshairs as things move forward — at least the crosshairs of attention if not regulation. Flavor is really aroma- we only taste-bud- sweet, sour, salty and ‘meaty’. All perfumes are essentially ‘flavors’ to be inhaled, would expect that there is a body of work on safety of inhaling various flavors in the perfume manufacture OH&S rule book. Thank you Mr Price but these posts on ECF are the work of well meaning amateur users many of whom are quite intelligent but none of whom seem to be able to provide an authoritative composition other than to say it is a solvent based extraction. I am interested in residual solvent levels and their effect — or lack of effect — on lung tissue. Thank you. Polycyclic aromatic hydrocarbons[solvent residues] (PAH) were quantified in several reports in aerosols [5,6,42] and liquids [7,18,41]. These compounds include well-known carcinogens, the levels of which are not subject to TLV but are instead to be kept “as low as reasonably achievable” (the so called ALARA principle). For PAH, only non-carcinogenic pyrene that is abundant in the general environment was detected at 36 ng/cartridge in 5 samples of liquid ; PAHs were not detected in most of the analyses of aerosols, except for chrysene in the analysis of the aerosol of one e-cigarette. Has anyone seen an intelligent discussion of tobacco absolute — how it’s made, residual solvent levels and safety of inhalation? My understanding is that the residues, of tobacco related compounds and so on, are at very low levels, not regarded as an issue. Thanks John — that seems to be the implicit working assumption; I am just trying to better understand the actual composition to verify that working assumption. There are many posts on ECF about this. The best way to locate them is to use a Google search of ECF. i think there is a ‘whats in a name’ issue lurking in much of this- if e-cigarets were called ‘electric nicotine replacement therapy’ harm minimization devises ….. rather than e-CIGARETS , I think much of the confusion(near to moral panic) in the medical type fraternity would subside,least a bit. Greater Glasgow & Clyde (GGC) NHS Board has an estimated total population of 1,210,254. There were 34,436 quit attempts through NHS smoking cessation services in 2012. Smoking prevalence for adults aged 16 and over in GGC is significantly higher (worse) than the Scottish average (26% compared to 24% for 2009/10). GGC has 315,000 smokers and 2,000 succeeded in quitting for a year.On average, 30% of these will relapse. Can ecigs really do more harm than continuing with the current policy? Yes but they are falsely reporting quit statistics that are grossly under-estimated. They want to let Big Pharmers the experts make it their own. Is this based on the entire EU population? Or is it a rushed and hurried study? see below the graphics…based on…. whatever you can believe here. + no reason to think prior use of e-cigs is causing any smoking that would not otherwise arise. Apart from that, it’s a crisis!! Eurobarometer Surveys last report is from Mai 30.2012….is there any hope it will catch up? OMG…how do you understand that?? ?…cannot believe my eyes! Klaus K. Has what I would call a grip on the entire gist of it. Thank you again Clive Bates, otherwise how would someone know whether they were being “paranoid” or not! ..thats sounds really familiar whats going on with the e-cig. Does anybody know if this organisation has picked up the e-cig issue yet??? R.C there is an authority which can force them to prove their statements – it’s called Government! Unfortunately it appears to be as deep in hock to the Pharmaceuticals as everyone else. Read the Peter Rost clip. Why wait for the football clubs to answer? Send your brilliant letter to this Dr.Thomson right away, say …”a little bird has twittered in your ears, that….” …why not? Thanks for taking the time to draft a response and share it with us Clive, great read. Would love for some of the clubs to actually use it! 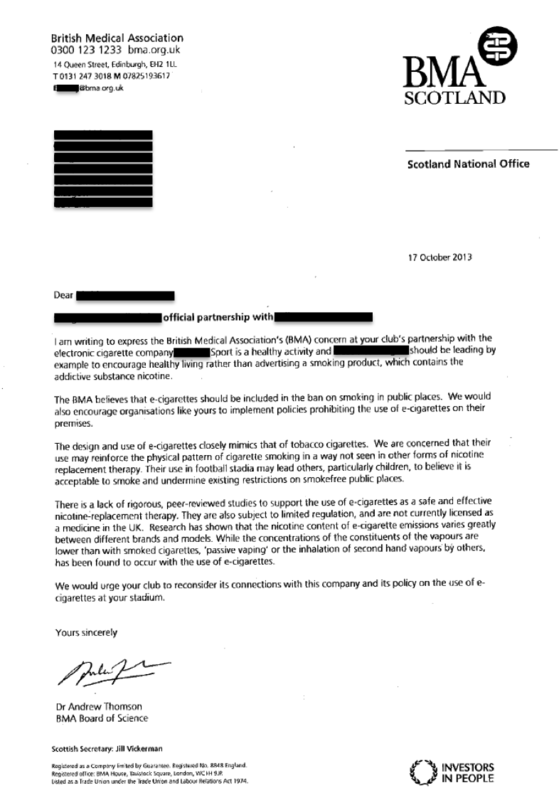 The BMA, as you say, Clive, does not like to debate e-cigs. Viv Nathanson, particularly, is very uncomfortable when she realises that there’s someone who actually knows which way is up with whom she may need to debate, to the point that she will try to badger them, as she did me on a radio interview. IMHO, they know they’re lying – are they not aware of the date of guilty knowledge? of course, they know they are lying 100%…nobody is such stupid by nature! They just want to get the e-cig market in their pockets!…what they cannot admit openly. What makes me hysterical…is there not an authority which can force them to prove their statements? Why do they want these e cigs classed as medicines when they are so against them. Corruption and control of the market? I would also add that the UEFA Champions League is sponsored by Heineken. The England football team has Carlsberg as a sponsor. The League Cup is currently named the Carling Cup. Alcoholic beverages are sold and consumed in open view, at virtually every stadium in the country. Do they have any information on the possible negative health and social effects of alcohol? Are children immune to this advertising and exposure to consumption? Have they really considered where their priorities should lie, if the arguments against e-cigs are applied to alcohol? I wonder…why dont the industry sue such deformations of their products ? ….why dont BigTabacco sue such liers….since they sell e-cigs too….I hope that will happen soon! Very fine letter, Clive. However, it cannot be ignored any longer that the whole medical establishment, single doctors as well as medical organisations, are making these absurd claims about E-cigs (and snus) because they are so broadly sponsored by the pharma giants: the Nicorette-producers. This is not even a secret since it is openly disclaimed on the pharma company websites. In other words it is no wonder why so many doctors and medical organisations are critical towards the E-cig. They are beholden to big pharma. The political trouble E-cigs are going through has nothing to do with the tobacco industry as some people seem to suggest. The simple truth is that people in the medical establishment are protecting big pharma’s competing product, the NRT’s. And who knows? Maybe they really will loose some of their nice handouts if they don’t? Of course this opens a door to a much bigger question than smoking or E-cigs. Cause if we can’t trust the medicinal establishment to tell us the truth about E-cigs (or snus) … how can we trust their answers to other questions? How can we trust them at all? Very enlightening – it does explain why James Reilly and John Crown hate ecigs so much.14 out of the worlds’s 15 biggest pharmaceutical companies have bases in Ireland and drugs account for 50% of Ireland’s exports. Following on from Kenny ‘Eagle eyes’, should not the ‘the’. I.e. third word after the subtitle ‘A fair assessment of the potential benefits?’, be ‘that’ or even omitted entirely? Excellent riposte Clive. Their letter is obscenely prejudiced – your reply is brilliant; thank you so much. Thank You so MUCH Clive Bates, incredibly good read! So much common sense and truth. In the section entitle Nicotine Variability, near the end of the paragraph. The word break should read “brake” I think. Otherwise, brilliant. They will not respond because they cannot respond.One might ask if they are happy for medicines to be used in stadia or is their end-game really to eliminate/neutralise ecigs completely with an ‘assist’ from the MHRA? Very good question… do they just erect a barricade, defend a front, retreat, erect another front… repeat ad infinitum. I’ve always thought these objections were led by ideology not science or real concern for health. That’s why the snus case is so revealing. They looked for expedient arguments to support a ban on snus (gateways, dual use, reduced cessation etc), but when those arguments proved utterly baseless they still didn’t change their position on wanting a ban. This is why you can’t trust any of those who backed the snus ban to ever do the right thing on e-cigs – whatever the evidence says, because it isn’t actually about evidence. I wonder if the BMA also write along these lines to councils. Has anyone seen the letters the BMA send out to employers, I am curious to know whether these are responses to inquiries or unsolicited mail shots… I suspect the later. I know they throw in all the usual nonsense like second hand vapor contains nicotine & you don’t know whats in them etc. Please tell me that a club has responded with a response like this, that would really nake my day. Maybe they will… but not so far. Most clubs would worry about getting into a fight with the BMA on health issues, but I hope they at least take heart from this and feel confident they are doing the right thing. Excellent letter. This is something the vaping community could use as a standard response to the sponsored media fear-mongering that is constantly attacking ecig use. I will quote you often, if you don’t mind. I’m hoping those receiving letters like this will respond using some of the lines in here… any other ideas for rebuttal points and I’ll add them. A perfectly stated reply – thank you. Perhaps the time has come to investigate the BMA’s sources of funding in order to determine whether they are corrupt, or just crackpot ideologists. Both, perhaps, as seems likely due to their unrelenting promotion of ineffective pharmaceutical products, the fabricated statistics they have to remove from view when exposed as lies, and their apparent support for useless, bankrupt policies that waste large amounts of taxpayers’ money and that have not produced any benefit for years. BMA is mainly funded by subscription from doctors who have been enormously enriched by its successful pay bargaining with the NHS. A lot of things are done in the name of doctors that many practising doctors would regard as quite mad, bad or dangerous. BMA uses ‘argument from authority’ and doesn’t really have scientific credentials to back it up… It won’t actually come out and debate it with vapers or public health advocates that disagree with them, like me. History teaches many things, one of which is that the credibility coin lost is often of more value than those held. Oft-lauded ‘bastions of public health’ are queuing up, it seems, to throw credibility coins into the e-cig fountain. Care for a scenario….Imagine all ecigs banned …..can’t buy them…companies sell out it’s a done deal….oh…the buyout is already happening before the ban by the big tobacco….now why would big tobacco purchase something that has no future..only thing that comes to mind is they are already regulated and have millions of addicted customers and what’s to lose knowing gov will let them sell them with nicotine anywhere and the big bennefit is……. taxed to death …just like tobacco…so who would be the winners? We need to take one giant step here and unite world wide or our rights have gone to the left…overs. I’m pissed and so is everyone else with emphysema COPD cancer and we all had to pay for it to get it. They know this …they don’t give crap like a parasite they gouge on our weakness….time to fight til my dying day against these liars. Let the truth be know all the research needs to compiled and spread around as much as the lies and deceit. Thank you so much Clive for sharing your vital knowledge and wisdom. I am but one who needs your help as I am but one who is suffering because up until just over 60 days ago I did not have a chance at quitting cigarettes. Having advanced Emphyzema and still smoking made every breath I took a challenge. The electronic cigarette I opened my mind to changed all that…I now have a choice which is my God given right. Thanks you for sharing with us. God Bless you.